FULLERTON — Cal State Fullerton’s Modern Languages and Literature Department will present a screening of the animated anti-war film “Grave of the Fireflies” and a panel discussion about Japanese American children who were affected by World War II on Thursday, Sept. 27, in Room 123 of the Humanities-Social Sciences Building on campus. 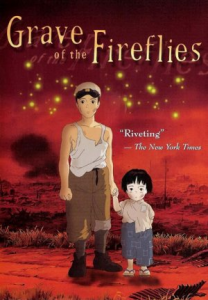 Screening at 4 p.m., discussion from 5:30 to 6:45 p.m.
“Grave of the Fireflies” (1988), directed by Isao Takahata, tells the tragic story of a boy and his sister who struggle to survive in Japan during World War II. • June Honma was a 5-year-old living in Hawaii when she and her family were deemed “spies” and sent to an internment camp. Her memories closely resemble those of a main character in the film. Her father, the late George Hoshida, was interned from 1942 to 1945 and documented his experience through his artwork. • Yoko Osumi was born in Los Angeles and as a young child lived in Kansai, the area of the bombings shown in the film. • Elsa Okuda, a native Californian, was 11 when she was sent to an internment camp. Parking is $2 per hour or $8 for a daily permit. For maps and directions, go to www.fullerton.edu/campusmap/.